Francoise Gilbert is the Author and Editor of Global Privacy and Security Law, a two volume treatise that analyzes the privacy and data protection laws, usages, and trends of more than 60 countries. 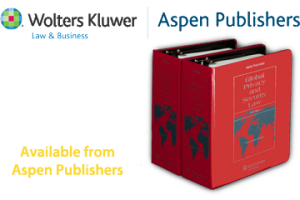 Global Privacy and Security Law is published by Aspen, available here. An increasing number of foreign laws aim at protecting personal data, and preserving and strengthening human rights and fundamental freedoms. These laws are relevant to global companies. Negotiating a deal, corresponding with clients, exchanging contact information for the delivery of a shipment usually entails thecollection, transfer, use, or storage of personal information. As companies exchange personal information of their employees, clients or contacts with entities located in foreign countries with a different culture, history, political regime, and different laws, they must remember and take into account these differences. We cannot expect a service provider in the Philippines, or a distributor in Italy or Argentina to act in the way we act, to have priorities that are similar to ours. We cannot expect them to treat – or be required to treat – personal information in the same way as we do.